James J. Braddock was a once promising light heavyweight. But a string of losses in the ring and a broken right hand happened to coincide with the Great Crash of 1929—and Braddock was forced to labor on the docks of Hoboken. Only his manager, Joe Gould, still believed in him. 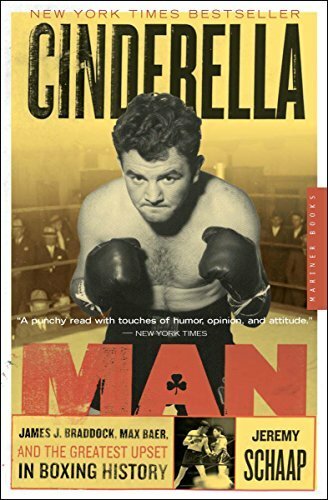 Against the gritty backdrop of the 1930s, Cinderella Man brings this dramatic all-American story to life, telling a classic David and Goliath tale that transcends the sport. I loved Cinderella Man. It was such an amazing story that was well written. I think it will make one of my top books from 2018 because I had so much trouble putting it down. It was slow to start with and was a bit confusing because it jumps ahead and then comes back to the beginning of story. Once I got past the first chapter, I couldn’t stop enjoying it. This is a true comeback that encourages people to try. The book though also integrates boxing history and how bowing and its rules work. I learned so much and was also able to understand more of how people felt during the Depression and how so much of society loved boxing years ago.